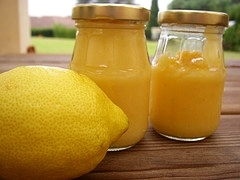 Do you want to learn how to make lemon curd? You will want to put it on everything from biscuits, muffins and scones (it is a tremendous cake filling). I am also offering a tasty lemon cream recipe below. These recipes and tips are from Dorie Greenspan's cookbook: Baking - From My Home To Yours. She is a genius. This classic lemon curd is smooth, creamy and quick to make. Once cooled, the curd is great as a spread for biscuits, scones and muffins or as a filling for cakes or tarts. For something with slightly more tang and less buttery, opt to the Lemon Cream Recipe below. Place all of the ingredients in a heavy bottomed saucepan and stir with a spatula to moisten the sugar. Cook on medium-low heat and stir without stopping until the butter melts and the mixture thickens like custard; approximately 4 to 6 minutes. It is ready when you can run your finger along the spatula and the curd doesn’t run into the track you just created with your finger. Don’t worry if it looks thin, it will thicken as it cools. Wrap tightly and cool to room temperature before storing in the refrigerator. Learning how to make lemon curd really is fun. Try the lemon cream recipe below; it's delicious. This lemon cream tastes less buttery than my Lemon Curd Recipe, and a little tangier. Use it to make a tart, fill a cake, or serve it alongside cookies or bread. Once you learn how to make lemon curd, the ideas are endless.